This antique sign advertises Smokey’s Garage. The sign is rectangle and black. “Best Damn Garage In Town” reads the motto underneath the “Smokey’s” logo at the top. 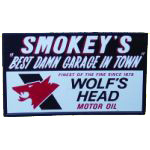 Below is the silhouette of a wolf, advertising “Wolf’s Head / Motor Oil.” The text is red and black against a white field.